This past Tuesday, we had our second Quick Bytes in Hampton! It was all about Google+, and it was so great to hear the excitement about that social media platform because I *love* that social media platform. The ah-ha moments happened with pages and profiles, and it really got our thinking about how we can build a great local support system and beyond. We chatted about "The SEO Effect and the G+ Force," the power of engagement, and tons of tricks and tips for harnessing Google+. We're headed over to Instagram in April... so here's your Save the Date! 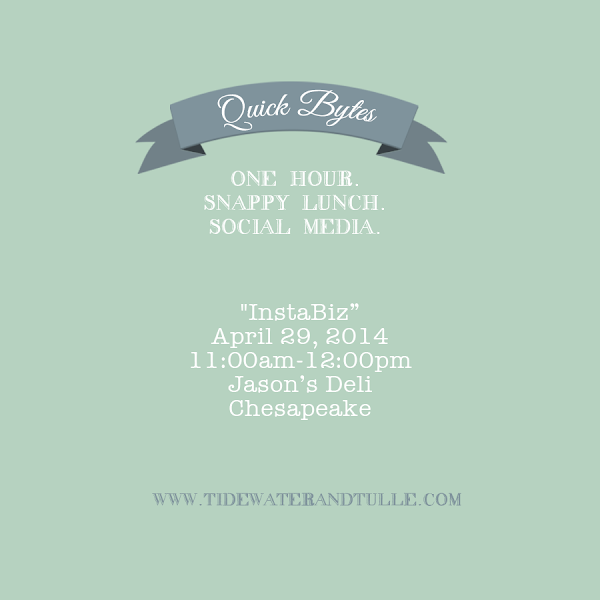 In a few weeks, keep an eye out on our Facebook page for the "InstaBiz" Event to pop up because spots will be limited to just 10 people to keep it focused on quality and one-on-one. Looking for more information about what Quick Bytes is? Head over to our original Quick Bytes post.